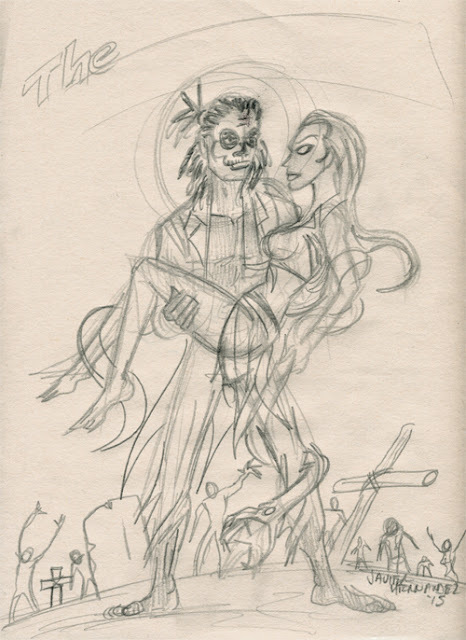 As you can see, at the time I didn't even have a name for them, but my initial idea was that he'd be a houngan (vodou priest), she'd be an undead earth goddess and that they'd be a married couple. The male character would also be a capoeirista, a student of the Brazilian martial art capoeira. 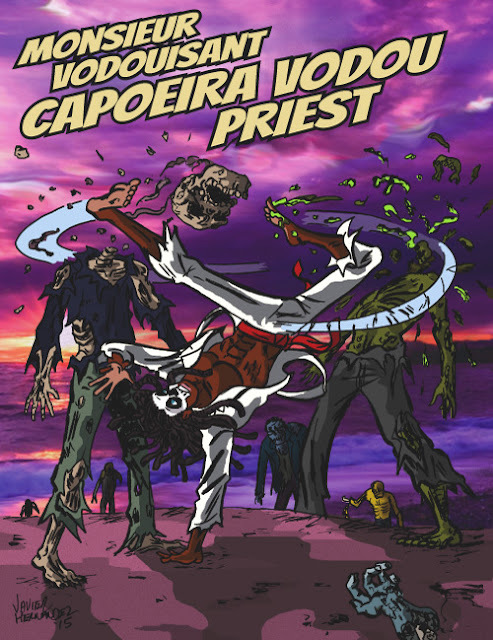 That particular style always fascinated me, and in doing some research for my story, I learned that both capoeira and vodou came to the Western hemisphere through the slave trade from Africa. Rather than let their culture die while under oppression, the slaves in Brazil and Haiti kept their cultures alive even while being officially forbidden to practice their religion or, in the Brazilian case, their martial art. It's a fantastic testament to the will of the African descendents to cling passionately to their culture under such circumstances. Defiance in the face of adversity isn't a trait unknown to comic book heroes. It took me forever to come up with the character's birth names. I wanted names that had a colorful sound to them, but also ones that would incorporate their cultural and national identities. 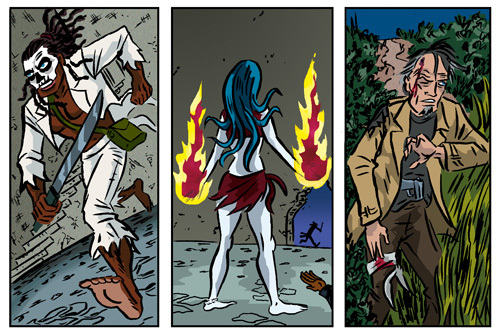 Halfway through completion of the comic I settled on the names Celestina Boyette & Cristiano Mompremiere. It's the longest I've ever gone in naming characters, but sometimes you have to dig around until you're finally satisfied with what you come up with. 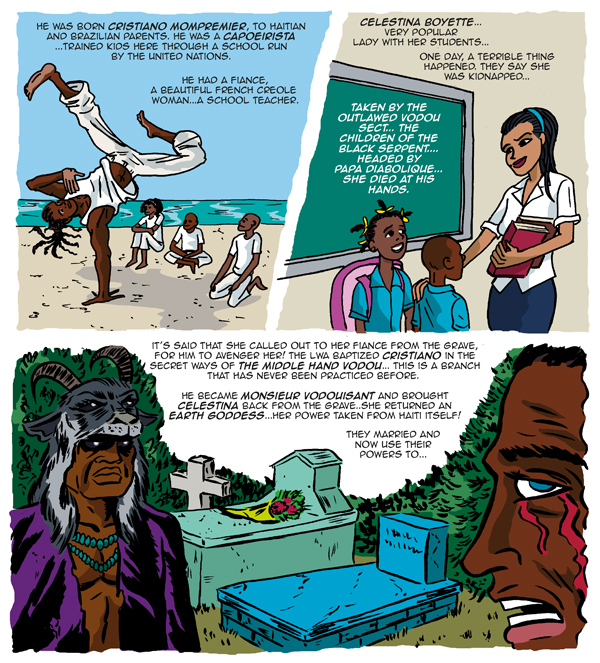 For the longest while, I've been in interested in doing a story involving vodou. 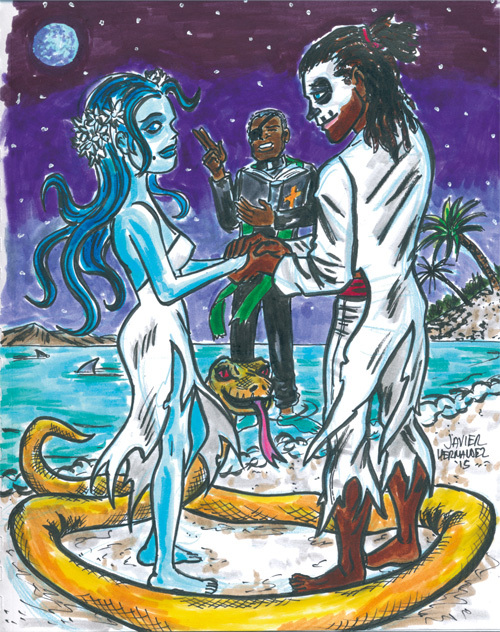 Like most people, my earliest exposure to vodou was via the prism of movies and comic books, a highly stylized and fictionalized one at that. 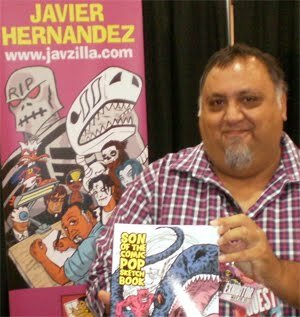 The James Bond film LIVE AND LET DIE, the Italian horror film ZOMBI 2 and the Marvel Comic book series starring Brother Voodoo kindled my imagination as a kid and has stayed with me all these years. 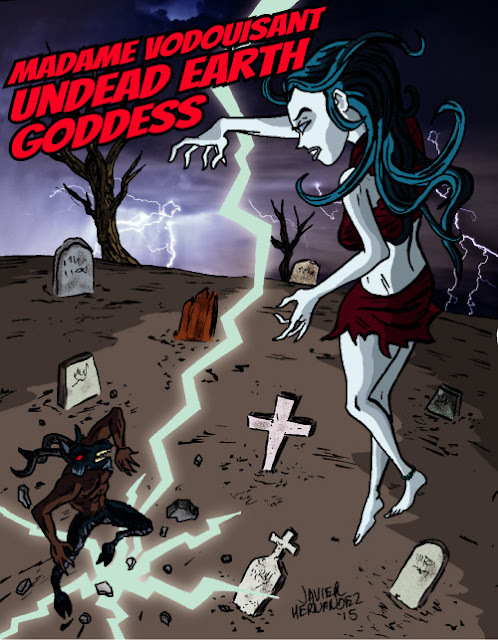 We all know zombies are all the rage nowadays, and they're definitely good material for a story. 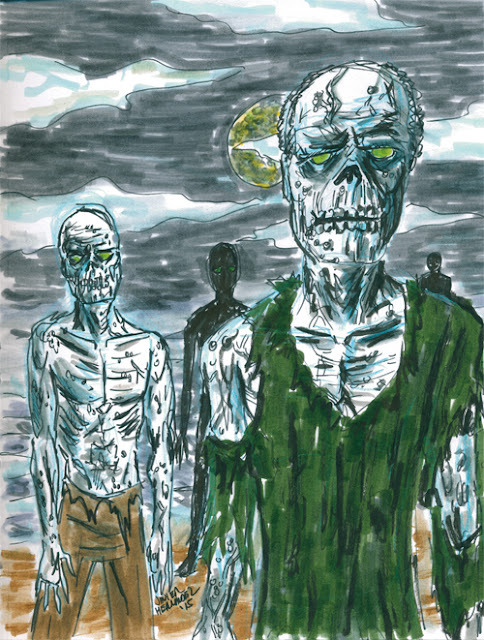 But I always found that the zombies as they're known in Haitian folklore have a more interesting back story as opposed to the typical zombie 'virus' or 'scientifically explained' zombie. 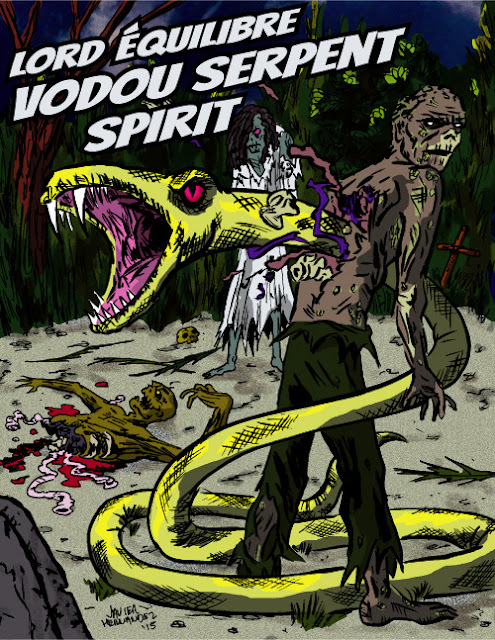 The supernatural zombie, as brought upon through Haitian vodou, provides a rich tapestry that weaves elements of culture and religion through it's threads. There's rich story elements to approach from that angle, at least that's the appeal to me. How much would someone undertake to bring a loved one back from the great beyond? 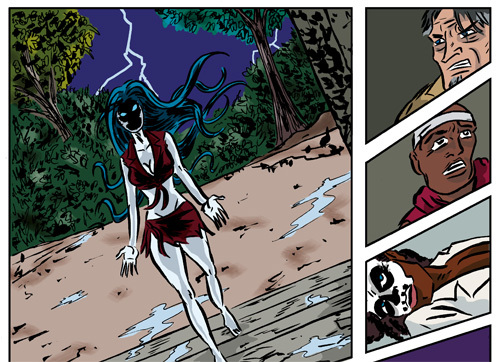 Vodou was the backdrop I wanted to use to explore that. In researching the religion, one thing that became clear to me was that vodou can be practiced differently with from town to town, even individual to individual. 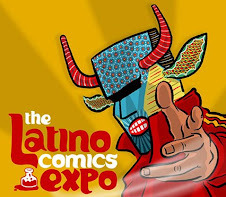 There's no central vodou governing body, no vodou 'Vatican'. 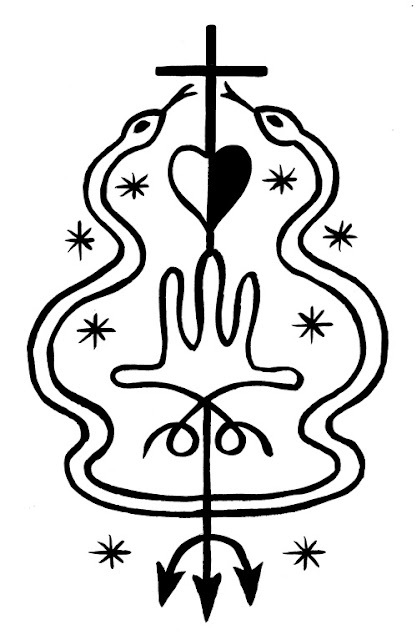 The broad strokes of vodou seem to appear throughout all of it's incarnations, but the nature of the religion seems to be, to my limited knowledge, adapted as it's practiced from one group to another. 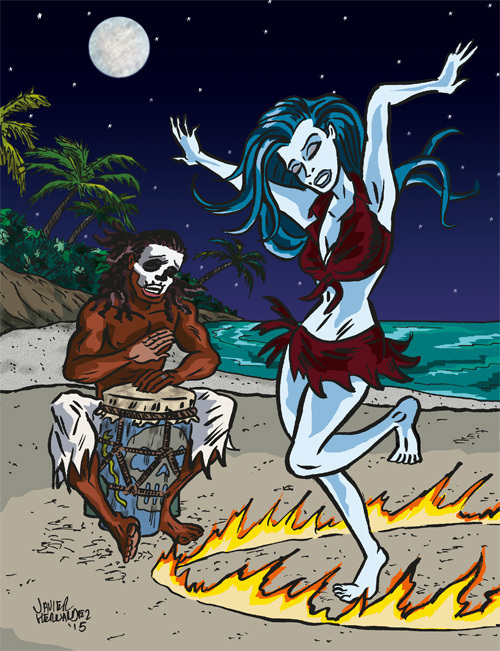 One of the things I learned was that, while the bad (evil) aspects of vodou are the ones that have been most popularized in fiction, the majority of those that practice have no ill intentions. It's just a form of worship, as found in most religions. But there are indeed cases when the bad side can be invoked by individuals. 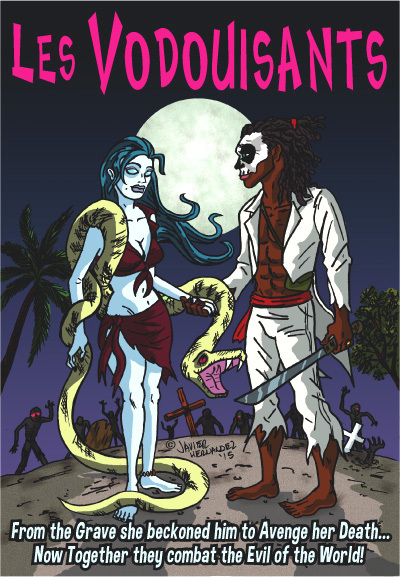 Left hand and right hand vodou, is what it's been referred to. So it's there that I thought I could distinguish my own story, by creating the 'previously unknown' branch known as 'Middle Hand vodou'! 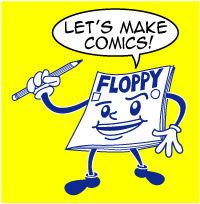 If no one's ever heard of it, then I could create something to fit my story. 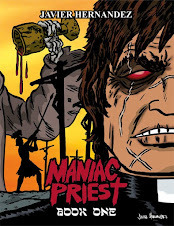 Plus it allowed me to introduce a 'new' god as well. In the end though, despite any research I may do for a book, the whole goal is to create some new exciting characters and involve them in an engaging story using my skills as a comic book creator. 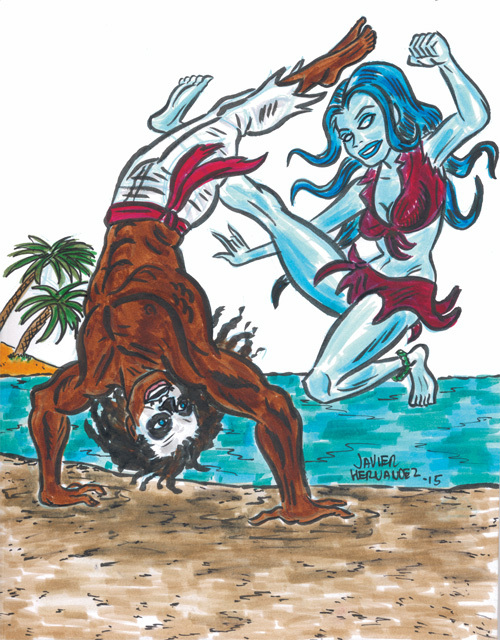 The comic isn't 'about' vodou or capoeira, but about Les Vodouisaints and the world I created for them. Hopefully you'll join them in that world, as I'll have an announcement soon about their official debut.